In the process of creating a position in Interfolio Faculty Search, you are also creating an "Apply Now" landing page that will announce your opening online. You can copy the unique URL of this landing page and use it wherever you want to post your position. Once the open date of your position arrives, the "Apply Now" page will be published automatically. 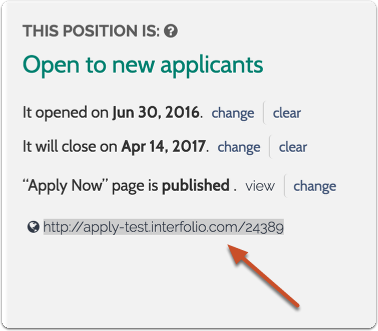 You may also publish the "Apply Now" page manually when editing a position.